All of our dog coats are handmade in Boulder, Co. USA from top quality technical fabrics and leathers. 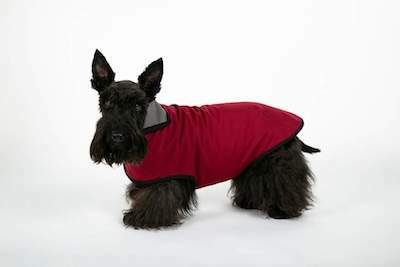 We offer custom-made coats and sweaters for smaller or larger dogs or dogs with unique body shapes in addition to our stock inventory. Our fabrics and designs are geared to meet the individual needs of older dogs, active dogs, couch potatoes, travelers, ill or disabled dogs. We select functional, beautiful, fashionable colors and fabrics that you won’t find in pet stores. When you Book A Fitting we’ll measure your dog for his or her handmade dog coat to insure a personalized fit. Back length, chest, shoulders and hips and are all measured and discussed before we begin. 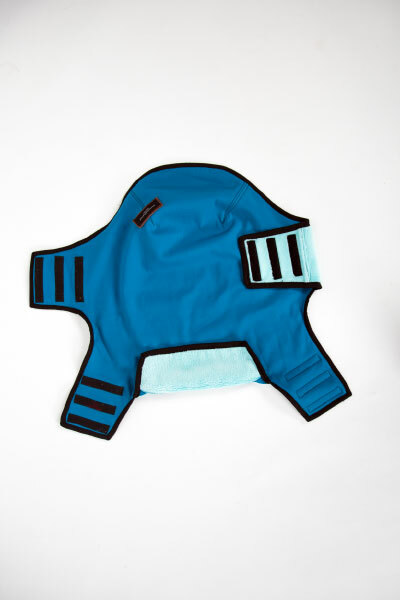 Chest and tummy panels are cut wider or narrower to cover your dog’s unique body. Your custom made dog coat can be made with or without collars. You may also choose from our fabrics or supply your own. Our handmade dog coats are durable and can last for years if laundered properly. During the past year we’ve gotten requests for custom garments for dogs with unique needs: sensitive skin due to illness/medication, winter and spring coats for hunting season, a unique design for the chest panel. Our original design was for Mac who lost a leg to cancer. All garments drop right on and close up quickly. They’re so easy for both you and your dog. Tell us what you need. We’d like to help you get the right coat for your dog. Please contact us for more information or to describe your project. We’ll be happy to work with you to create your custom dog coat. MountainMuttDogCoats Boulder was created in 2011 to meet the needs of our canine family members living in the Rocky Mountains. Our goal is to create warm, properly-fitting winter coats that offer protection from long, harsh winters. We use lightweight technical fabrics engineered specifically to protect against wind, cold, water and allow for varying levels of activity. These coats have been successful and are worn by dogs in 30 states and Canada.